The first 50 mile race of the season seems to have come around very quickly. 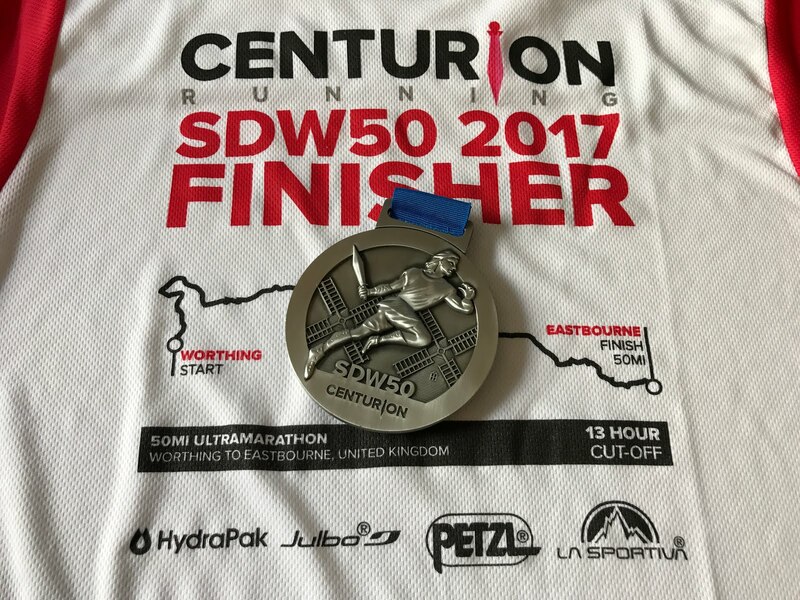 The South Downs Way 50 is the first of the eight races Centurion Running are staging in 2017. 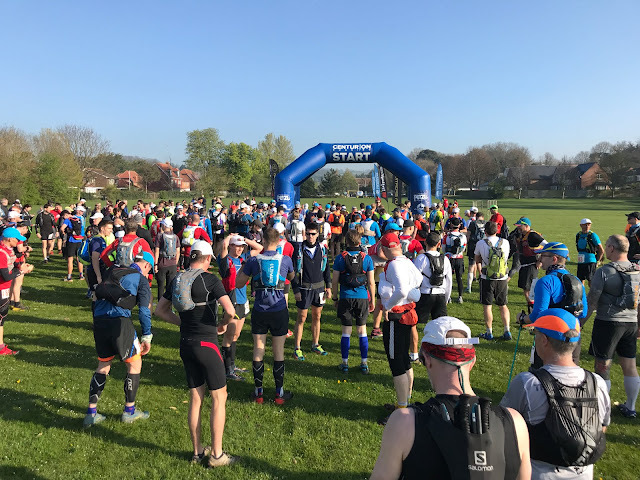 They organise four 50 mile races (South Downs Way, North Downs Way, Chiltern Wonderland, and Wendover Woods), and four 100 mile races (Thames Path, North Downs Way, South Downs Way, and the Autumn 100). I've signed up for the Grand Slam of 50 mile races which is achieved if you complete all four 50 mile events, therefore the primary objective of the day was to get to the end within the thirteen hour cut-off. The second objective was to still be running at the end - historically my legs have broken down a bit in the last ten miles or so of ultra distance events and I've had to march my way to the finish. Third objective, set a new 50 mile personal best time and tick off another distance in my year of PB attempts. The target was the 11:38:31 time I'd set last year in the Chiltern Wonderland 50. Thanks to Southern Rail and another of their apparently never ending series of strikes, the trains on race day were set to be even more unreliable than usual. I opted to minimise the risk and splash out on hotels for the nights before and after the race. Registrations were available the night before - this is a good move as it can get a bit busy and stressful on race morning with upwards of 300 people trying to register at once. I strolled up to Worthing College, Race HQ, and registered on Friday evening. It was nice and relaxed, I'm a big fan of pre-event registration. Race start was 9am, plenty of time for a light hotel breakfast of bacon, egg, tomato, and a couple of cups of coffee. For anything up to a marathon I wouldn't eat before hand, but when I'm going to be out all day I prefer to have something to start the day. There were a couple of other runners down in the breakfast area, one offered us all a lift up to the start which was very kind and saved me a 40 minute stroll. After the customary short briefing from James, and a show of hands of who was taking on the 50 mile grand slam (and a couple of nutters who are attempting all eight races!) it was time to set off. 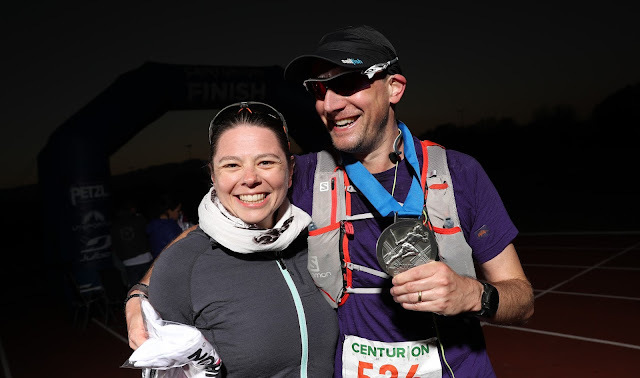 I'm always impressed at the number of runners who choose a Centurion race for their first ultra - their reputation for well run, inclusive, and friendly events is well deserved. We set off bang on time. Spirits were high, everyone was smiling, the sun was shining already - it looked like a perfect day for a run in the countryside. Given that the primary objective of the day was simply to get to the end, there was no need for early heroics. I trotted off at my own pace and soon fell in with a group of a dozen or so who were leapfrogging each other as we covered the early miles. In order to get a new PB I needed to average around 8:30/km. I had configured a display on my watch to show me the time the last kilometre took, and the average time per kilometre. Sometimes, just knowing how far you've been running or how far you've gone can be quite a negative influence. It means you're continually trying to do mental arithmetic to see if you're on pace or not. I wanted to remove some of that stress. The first half of the race passed by very comfortably. I'd set off a bit too fast (don't we always? ), but not to the extent that I'd regret it later. As always the aid stations were staffed by friendly and supportive volunteers, and the choice of food and drink was excellent. The weather was absolutely perfect. Bright and clear, warm but not too hot, and with a slight breeze to help sweat evaporate rather than get you all wet and drippy. 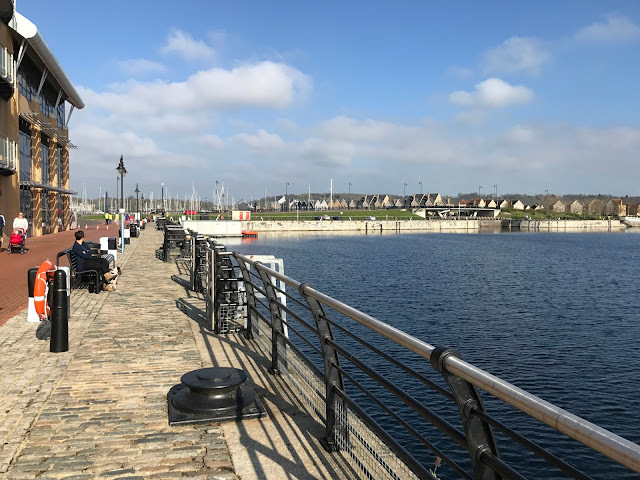 Maybe, it was a little too perfect - as we ran through midday and into early afternoon my arms and legs started tingling a little from the sun. The problem with a point to point race is that the sun is always on the same side - and the problem with the South Downs is that there's very little shade. We were being lightly cooked in a surprisingly strong early April sun. I passed through 40km, around half way, in just a couple of seconds short of five hours. 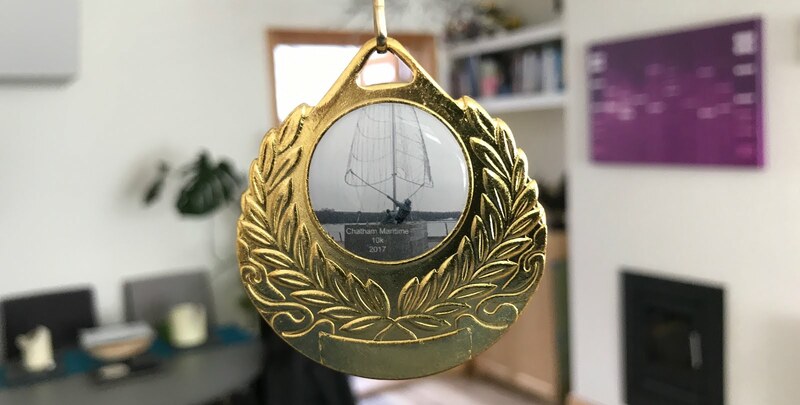 I expected a positive split (meaning the first half of the race is run faster than the second half) so I knew I'd take longer than ten hours overall, but it was looking good for a reasonable time - and I was in no danger of failing to meet the cut-off. After the half way point I was on familiar ground - I'd run this half in training a fortnight ago, and it shares shares a 10 mile stretch with the Moyleman marathon which was also just a few weeks ago. Sure, there was still 25 miles to go, but I could visualise most of it and I knew there would be no nasty surprises. Passing through the aid station at Southsea Youth Hostel, 50km in, I was happy to see Louise who topped up my water and chatted for a moment or two. I'm not a big fan of talking to people whilst racing, I prefer my own company, but it's nice to see a familiar face at the aid stations to exchange a few words with. Thanks Louise! 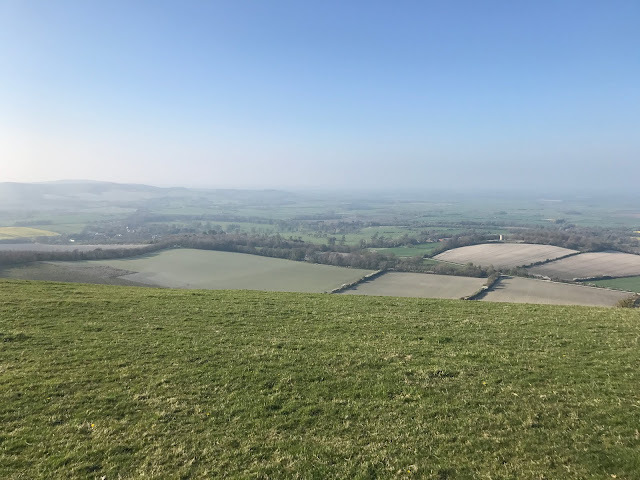 The second half of the route is very exposed, you climb from the aid station to the top of the South Downs, and follow the ridge for a good few miles. 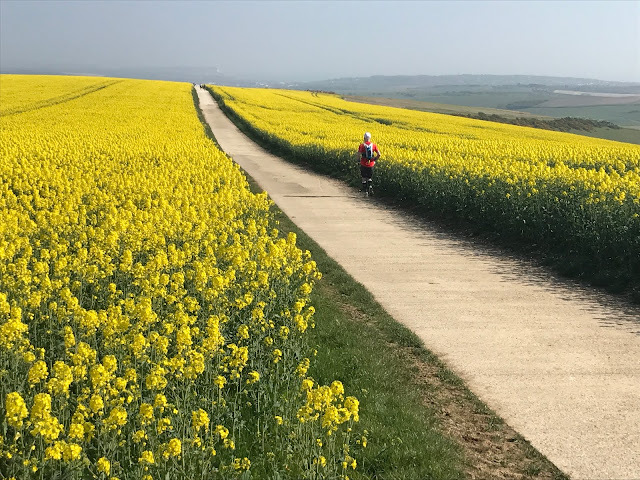 There's nowhere to hide from the sun, and the combination of growing sunburn and relentless chilling breeze was becoming a bit uncomfortable - however I was still running on the flats and downhills so progress was good. As the afternoon drew on and the sun started to sink a little lower in the sky the temperature dropped a few degrees. The aid stations are closer together in the final third of the race and started to feel like they were coming round more frequently. It was nice to meet fellow parkrun tourist Kiernan Easton at the last aid station, we've been Facebook friends for a while but hadn't managed to meet face to face before. 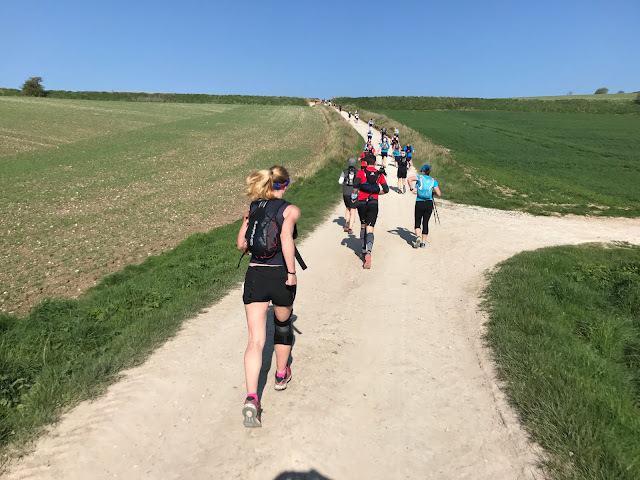 The final section was quite hard going, there's a steep climb up from Jevington and a few people were finding it very hard going and had dropped to a slow walk. I tried to keep my pace up and climb with determination - but it was challenging for sure. I'd been leapfrogging one particular runner all afternoon, and as he came past me with about 5km to go, As he passed he said "there's an outside chance we might just finish under eleven hours!". I had done well not thinking about aiming for a time, but with just 5km to go I was clearly going to get to the end, so I let myself take a look at the elapsed time. I'd been going for about 10:35, and I knew there were just a few kilometres left. He was right, maybe I could break 11 hours - that would be amazing! The final steep downhill into Eastbourne is tricky - it's narrow, a bit slippery, and there are lots of roots. I was taking it very easy - tired legs are easy to trip on if you're not careful. Once I'd got to the bottom I resolved to run, as best I could, to the end and try and get in under 11 hours. I summoned everything I had left in the tank, this was a race now! 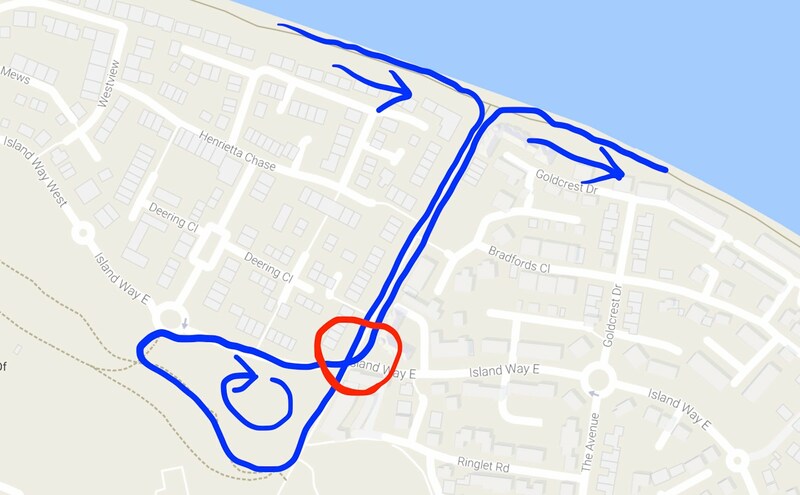 I was thankful for my recent training run on this part of the circuit - knowing where you're going and exactly how far there is left is so helpful in these situations. I ran non stop for the last few kilometres, overtaking a couple of walkers along the way. It looked like I might just do it. There's a cycle track running from a main road to the athletics ground which is the finish - I'm sure it's twice as long as it was a fortnight ago! Clearly some other runners had the same idea as me - I lost a couple of places along this stretch, but I couldn't go any faster! I rounded the final corner with about three and a half minutes to spare by my reckoning - but there was a lap of the running track to run yet! Mrs was here to greet me - she'd been on a business trip in the US and had come straight from the airport. She ran with me round that final lap of the track - I pushed with every ounce I had left and crossed the line tired, relieved, and very happy. 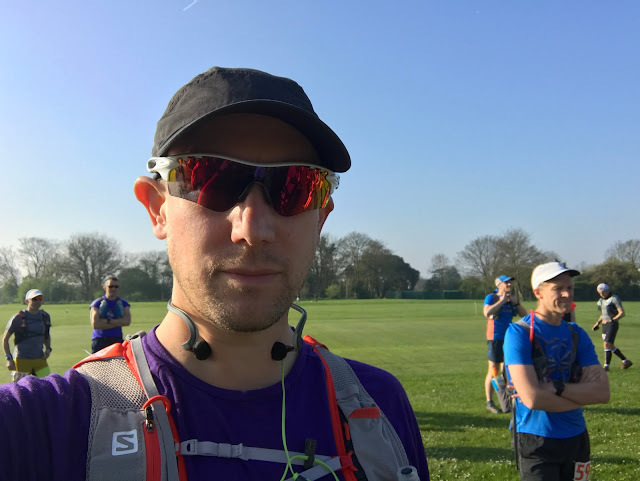 My official time was 10:58:12 - I'd dipped under 11 hours by almost two minutes, and had knocked an entirely satisfactory 40 minutes and 19 seconds off my previous best - with a new 10k PB last week that makes two PBs in six days! 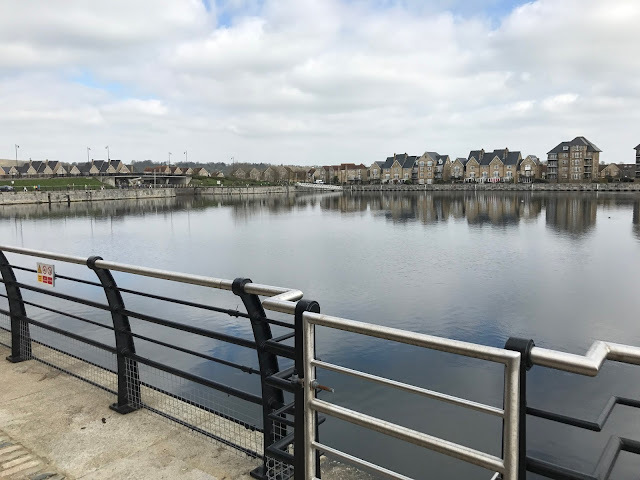 What was particularly pleasing was that my legs had held up enough so I was still able to run properly at the end - this is a huge confidence boost as it's been a real problem in the past. 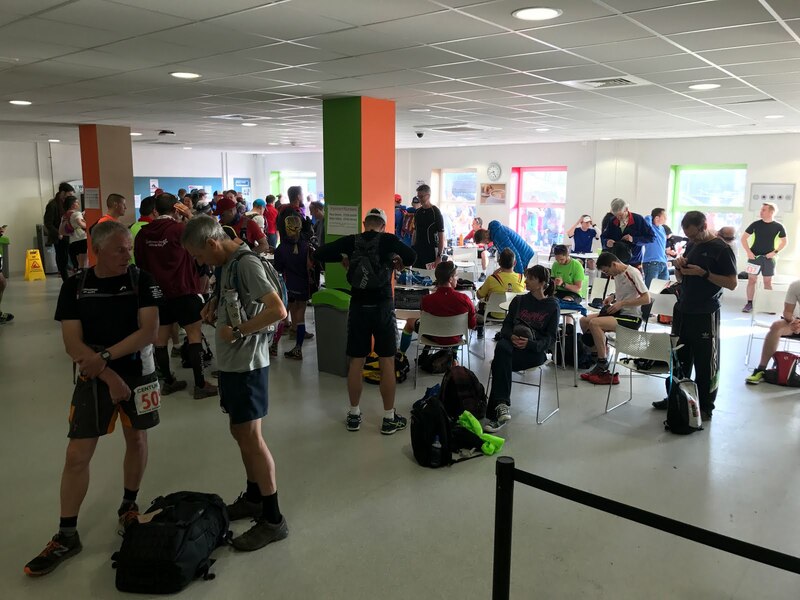 I was 275th out of 364 finishers, which I'm very happy with - 76% down the field as compared to 83% (132nd out of 159 finishers) at Chiltern Wonderland and 70% (100th out of 142 finishers) at Wendover Woods. What a wonderful day - amazing organisation, a great result, and a fantastic start to the grand slam. Just five weeks to North Downs Way 50 - bring it on! 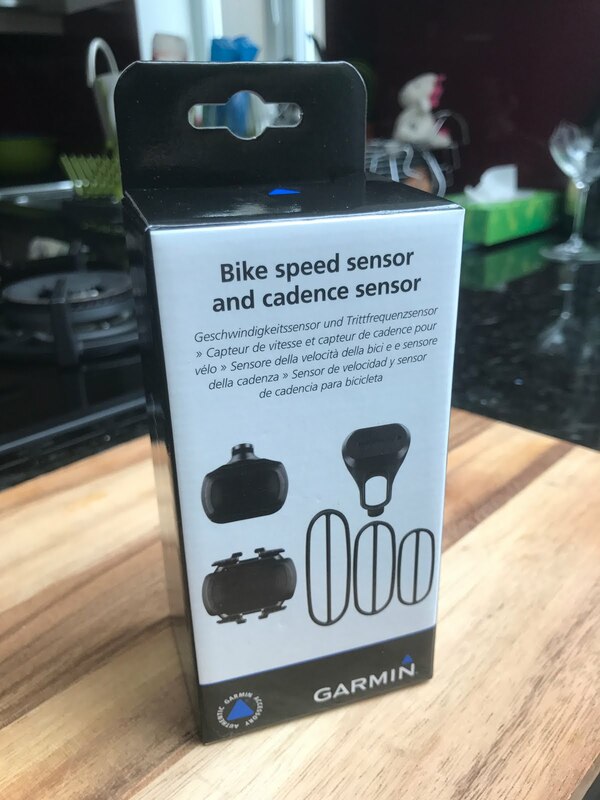 I've churned through many speed and cadence sensors over the years - usually it requires fiddling around with magnets and zip ties that invariably get twisted and damaged. They're also liable to get knocked out of alignment or snapped off - particularly in a crowded triathlon transition zone. Therefore, I haven't bothered for a while - but having done a few turbo sessions lately I wanted to at least keep an eye on my cadence. 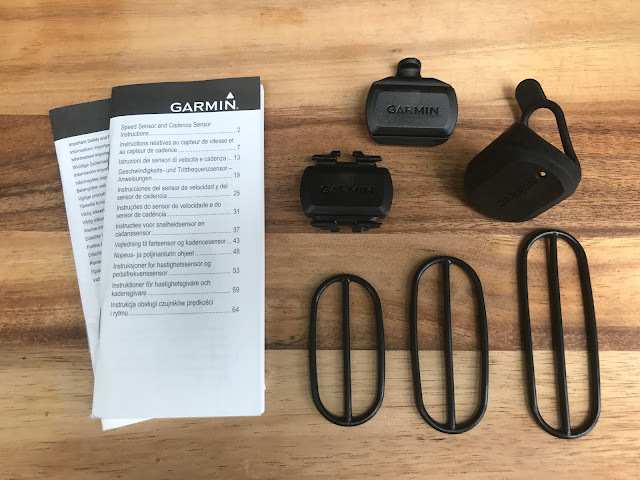 So, I thought I'd see what the latest offering from Garmin is. Turns out it's completely redesigned from last time I bought one, and infinitely better. Rather than being triggered by a magnet passing a sensor, these sensors have simple tilt switches - no magnet required. Fitting them is a breeze - just attach the cadence sensor to a crank arm (non-chainring side recommended) with the a rubber band (three sizes included), and the speed sensor to the hub. Nothing to line up, no further configuration required. It takes about two minutes form start to finish (including reseating the battery in the speed sensor as it wasn't transmitting at first). 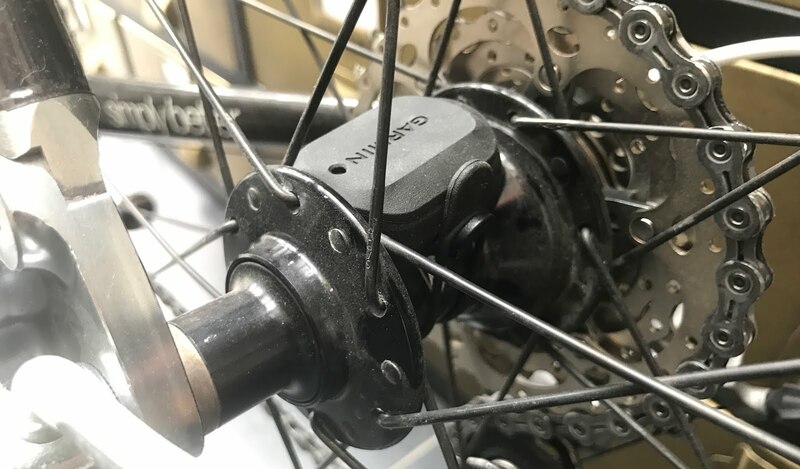 A small LED on each sensor flashes green with each rotation of crank or wheel, so it's simple to see that installation is successful. The batteries should last a year under normal use. The LED starts to blink red when they need replacing. The sensor units appear to be well sealed from the elements. The only moving part is the battery cover - this is well made and fits snugly, with a small rubber seal to keep water and foreign materials out. Connecting the sensors to a Garmin receiver is simple. I used a Fenix 3 HR and the pairing was immediate. No Bluetooth here - the sensors use ANT+ so don't expect a connection to a phone. 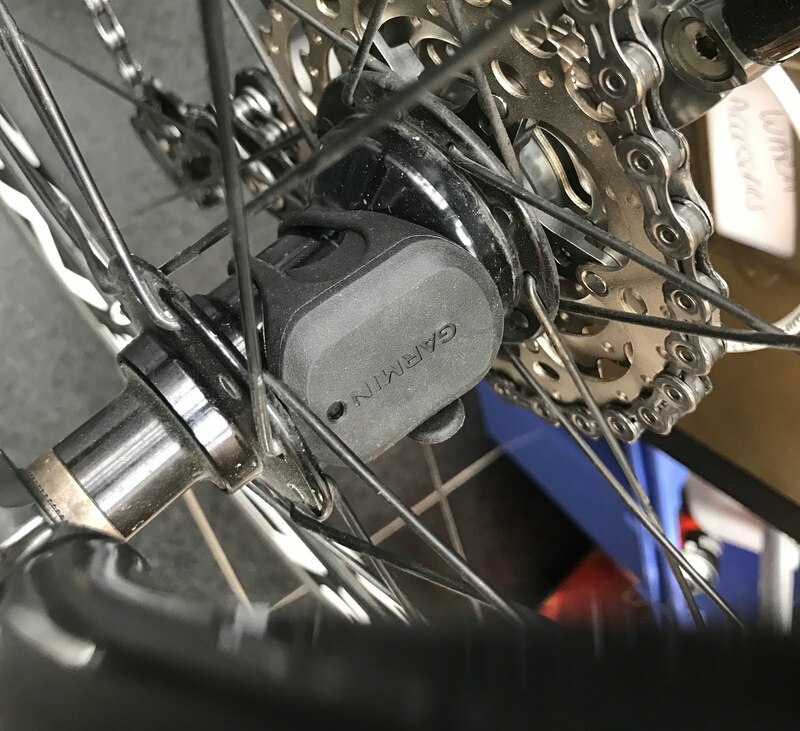 The Fenix supports renaming the sensors should you have multiple sets on multiple bikes - however fitting is so fast you could swap them across bikes easily. I can't comment on longevity as it's only been fitted for a ride or two - but I'd certainly recommend it based on my experience so far. I bought this from Amazon, but it's available from most cycle accessory retailer. In my quest to set all new PBs in 2017 I was looking at Run Britain a couple of weeks ago at what distances I was yet to have a race entry for. It's a great site for finding random little local races that you'd never hear about otherwise, and it's how we find races to enter when we're on holiday (like the Freckleton Half last year, or the Cumberland Ale 10 and Lancaster Half the year before). Mrs jetted off to New York on business yesterday, and I was looking for something to do today. 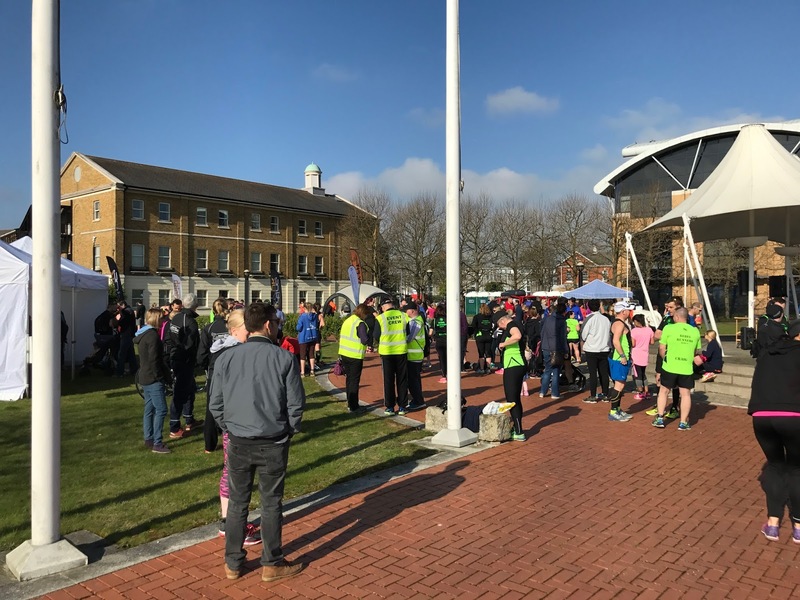 As luck would have it, I needed a 10km race and today was the first running of a new event, the Chatham Maritime 10k, over in North Kent that was describing itself as flat and fast - I signed up immediately. Race start was a civilised 10:30am, so no need to get up at the crack of dawn. Arriving at about 9:15am, I parked the car (the parking marshals were excellent) and went to register. 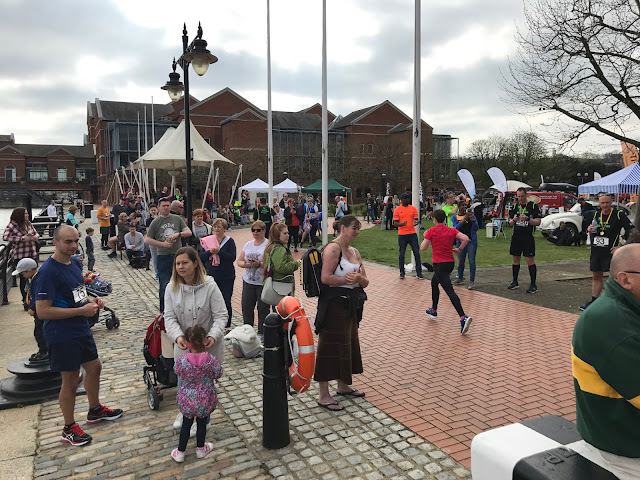 There was a very local community feel to the event, good representation from local running groups and even though there was just one little coffee van and six portaloos there were hardly any queues. I relaxed in the sun and drank a coffee. No food before the race today - I certainly perform better, at least up to half marathon distance, on just a black coffee. The weather was perfect for running - wonderful blue skies, warm but not hot, and just the gentlest of breezes. I used the time to work out my pace target bracket. The objective was to break 49:57, which I'd set way back in 2012. I knew I'd achieve that, I've certainly run 10km several times faster than that, but not a recorded race time. My gold-level outcome would be 47:30. So I was aiming to hit an average of between 04:45/km and 04:59/km. I set a new display on my watch to just give me "last lap time" and "average lap time", with a lap as 1km, which is all I needed to see to know how I was doing. 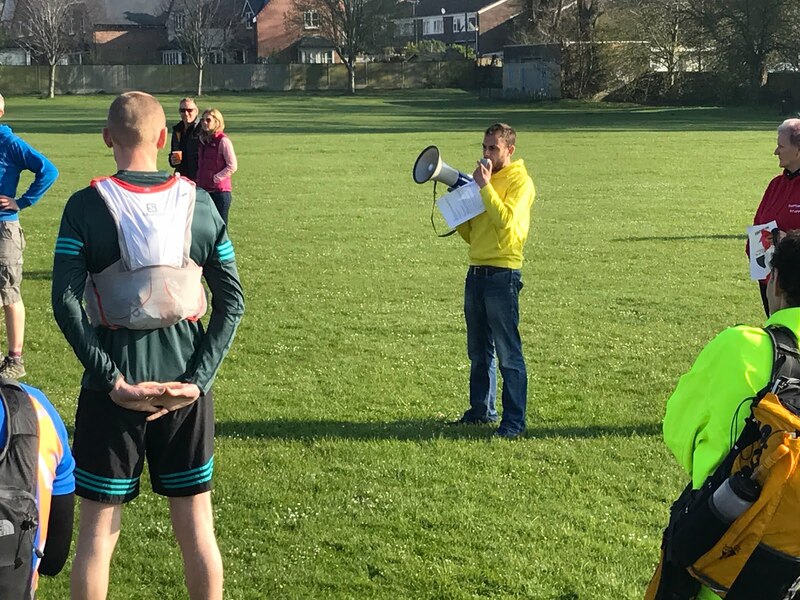 The MC gave the call for runners to assemble, and this is where the first opportunity for improvement for next year can be found. The start was down a long straight, a good 4-500m long, which is fine, however it was only about 5m wide. This can be workable with strict self-organising in pens based on predicted time, however there was no such guidance. There wasn't a lot of self-organising going on so I decided to start right near the front and try and stay out of trouble. I was in about the third row back. After a concise race briefing and with a three-two-one count, we were off! The decision to start at the front was a good one. The front row shot off like the rockets they are, and there was only a bit of manoeuvring required to go around a few slow-starters in row two, meanwhile I tried to run in a straight line so the faster runners behind me could overtake with ease. The runners thinned out very quickly, as a result of the relatively small field, with little packs and clusters already forming in the first kilometre. Several changes of surface and sharp corners thinned us out further. As I often do, I'd set off a bit promptly - but was amazed to see the first kilometre pass in 04:08! That was clearly unsustainable, but I really didn't want to slow down by 40 seconds to get back into my target bracket so instead I thought I'd just run easily, letting the pace drop off naturally. I focused on drawing in a few of the runners who had started even further outside their target pace than I had, and one by one I was catching them (and being similarly caught by the better paced runners behind me!). 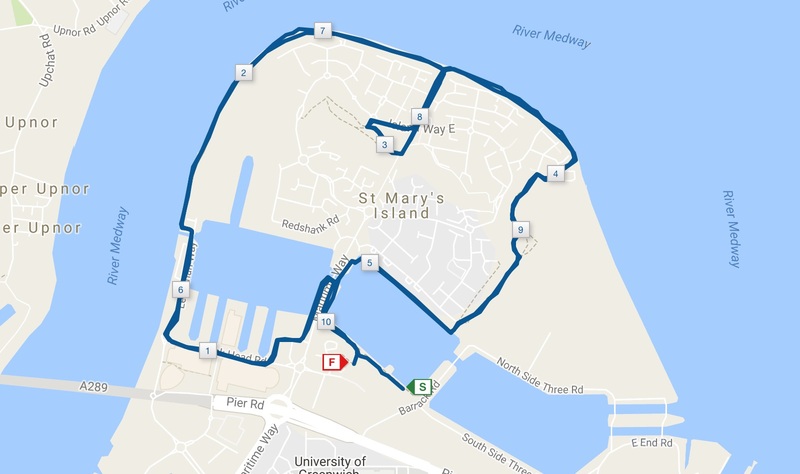 The exuberance of the first kilometre had dropped, but I was still doing well with 04:26, 04:23, 04:24 for the second third and fourth kilometres. 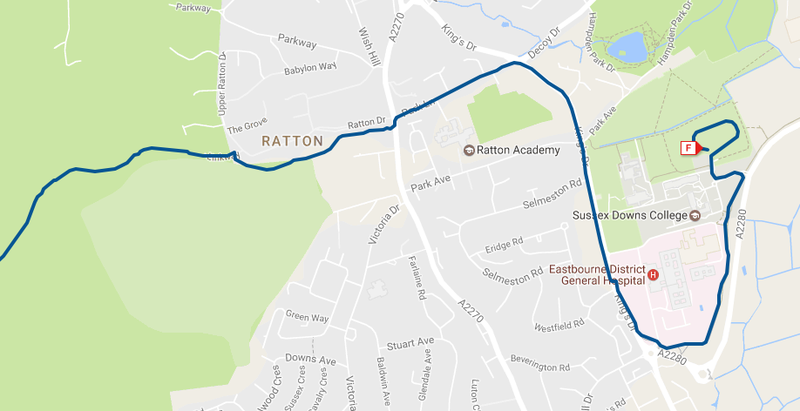 The route had one odd loop in it with a sharp right inland, a few hundred metres down a path, round a loop in a park at the end, and then back up the path to rejoin the bank side again. The odd bit is that the loop in the park was clockwise - so the runners completing the loop had to run through the runners arriving to start it. Why not run round anti-clockwise with no need to cross the streams? Coming up to half way I was still running hard, though the 5th kilometre took 04:38. I expected to pay hard for my fast start, and assumed that my one kilometre lap splits would now drift up. In any case, I was in for a good time, so I kept the pressure on. Well into the second circuit, I started doing some in-race maths (which is never a good idea!) and realised if I could hold my pace I'd be well set for 47:30. As I went round the odd loop the second time, and checked my average pace (still showing as 4:24) I suddenly realised that 4:30/km average was 45 minutes for 10km whereas I'd been thinking for the last couple of kilometres that it was 47:30. The realisation of a finish around 45 minutes gave me renewed vigour! I pushed as hard as I could for the last few kilometres - I pulled in a couple more people that were in front (though I note that three or four people ran past me at an easy consistent pace - I bet they didn't start at 4:08/km...). I forced my legs to keep going, focussing on speeding up every time I felt them failing - finally, I rounded the corner and crossed the line. My watch time for the race was 45:39.9 (though I realise I started it before I passed the chip-timing sensor, so my official time may be a second or two quicker). 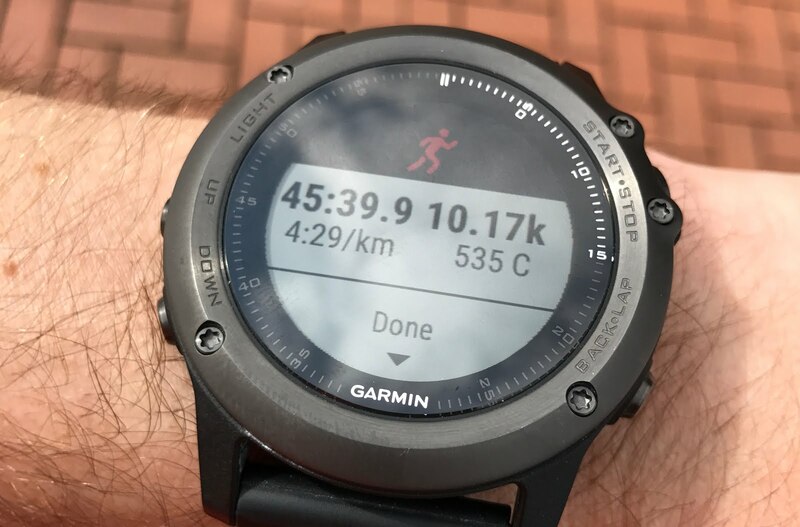 My watch GPS measured the course slightly long, at 10.17km, and showed me passing through 10km at a barely believable 44:54 - far better than I had even dreamed of for today. Garmin Connect helpfully has my previous fastest recorded 10km time - damn right "Accept"
In summary - a great race and a fantastic first event. Ask people to self-organise with some helpful timing signs, run round the loop in the other direction, and I'll certainly be back next year to try for another massive PB! The official results have just been posted. I was in 37th place out of 333 finishers which is by far my highest placing ever, and I registered an official chip time of 45:36.